Joe Dreamer and the Big Iguana is a children’s picture book written by Karlene Stewart and illustrated by Eminence System. Joe Dreamer loved to play cricket with his friends, Sammy and Devon, but he also loved to draw. His mom and dad were so proud of the drawings he made; some of them looked so real, his mom thought they might walk right off the page. One day, it actually happened. Joe had drawn a picture of a bird, and, as he watched, the bird materialized off the page and flew away. He liked that -- a lot -- but thought he should be careful not to draw anything too scary, like a lion or a tiger. After he drew that bird, Joe went off to play with Sammy and Devon. When he was chasing after a ball, he heard a noise in the woods. Maybe it was his bird? When he investigated further, he was stunned by what he saw. 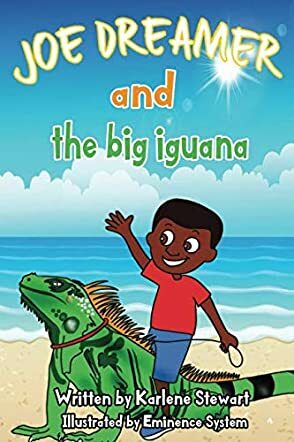 Karlene Stewart’s children’s picture book, Joe Dreamer and the Big Iguana, is an engaging fable that both encourages kids to develop their skills and shows them that scary, unfamiliar things like Joe’s giant iguana are often a lot less scary if you take the time to look at them and learn. Stewart’s book also showcases Joe Dreamer’s Cayman Islands home and introduces cricket to kids who are often more familiar with baseball, football and soccer. Eminence System’s illustrations work brilliantly with the story. I envied Joe his encounter with that giant iguana and loved how the artist made Joe’s bird come to life. The illustrations are brightly colored and cheerful. This book is a perfect selection for story time and will provide adults with discussion topics about art and developing your creative skills. It’s also suitable for new readers to try on their own. Joe Dreamer and the Big Iguana is most highly recommended.